If you’ve been a Christian for more than 20 years, you should be aware that something is changing in the religious landscape of the United States. If you’ve been a Christian for more than 40 years, you ‘know’ things are changing and changing fast. Surveys conducted by experts like Yancey are demonstrating an increasing negativity toward Christians and Christianity, especially the conservative branch of Christianity. Yancey and fellow sociology professor David A. Williamson (University of North Texas) recently wrote So Many Christians, So Few Lions: Is There Christianophobia in the United States? (Rowman & Littlefield Publishers, 2014) that was based on research with thousands of culturally progressive activists. “The focus of this book is Christianophobia and how Christians need to deal with it. It is a critically important topic that deserves our full attention. My goal is to point out the reality of this phenomenon to Christians and help them to think about how to adjust to it.” (Hostile Environment, p 23). 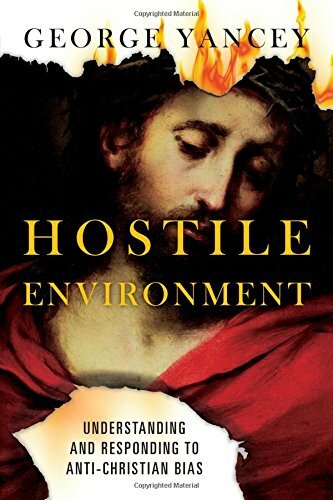 I believe Dr. Yancey succeeded in accomplishing his goal for the book and highly recommend Hostile Environment to any and all Christians who want to understand both the cultural opposition to Christianity and how to best respond in a way that bridges the spiritual gap and brings glory to God. “Christians working in the seats of power of the culture (e.g., universities, media, government) regularly experience challenges from those who oppose any sign of Christianity in the public arena. George Yancey’s book Hostile Environment combines empirical evidence with fair-minded, exacting analysis. Yancey has written a set of carefully reasoned principles and examples for Christians to consider in advancing their voices in what Richard John Neuhaus called ‘the naked public square.’ The book describes the underlying reason for the nakedness of the public square and the characteristics of those who aim to maintain its secularity. It offers principled remedies to all those who struggle to share the unique and productive knowledge that is in Christ to a society that thinks it has outgrown him. The work is fair minded, carefully researched, clearly reasoned and courageously argued.” —Mary Poplin, Claremont Graduate University, author of Is Reality Secular?